Polish Pottery Deviled Egg Platter. Deviled eggs are a tasty treat at any occasion and are especially popular during spring celebrations. This egg-shaped platter/tray is perfect for serving delicious deviled or hard-boiled eggs. 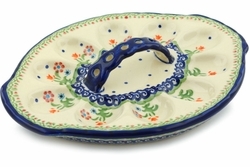 The platter may also be used for serving canap�s or small hors d'oeuvres. This handmade and hand painted Polish Pottery Deviled Egg Plate is a wonderful gift to receive or to give. Each egg plate is handcrafted at famous Ceramika Artystyczna factory in Boleslawiec, a Polish town famous for fine stoneware dinnerware.